Published Quarterly Since 1999. 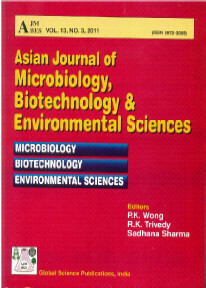 Asian Journal of Microbiology, Biotechnology & Environmental Sciences is published in March, June, September and December every year. AJMBES is a highly popular journal exclusively devoted to three most important and interrelated areas of science. Coverage: Research Papers, Reviews, Technical Notes, Book Reviews, Information on Conferences and Training Pogrammes all over the World, Topical Articles, New Publications and Products Information. Asian Journal of Microbiology, Biotechnology & Environmental Sciences journal is accredited with National Academy of Agricultural sciences, NAAS, India. Asian Journal of Microbiology, Biotechnology & Environmental Sciences journal also features in Uhlrich International Periodical Directory, U.K., Gale Directory, U.K. and SAARC directory of periodicals.